Brilliant! Glad you are enjoying the game enough to blog about it. I tend to buy additional copies whenever it goes on sale and gift them to my friends who may be interested. It's that good. Also taking a moment to celebrate being "clean" of eve online for a year tomorrow night. Though I still indulge in reading your posts and any news of nullsec. This is a gloriously hilarious thing to keep track of. I'll be clean of EVE myself on march 2014. Kernel space program like eve, mine craft etc is one of those incredible games you find yourself wanting to tell your exploits to everyone. "so I inadvertently stranded jebidiah on the mun........"
As for this mod You are showing: Mechanical Jebediah is for kids (autopilot part). 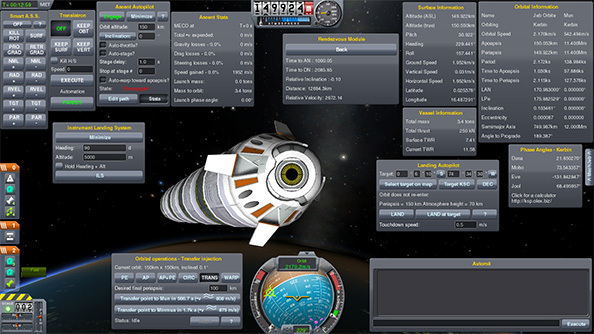 Real Man use vanilla KSP (unless mod adds something that is not already in the game like kethane for diffrent kind of expierience). Ofc mechjeb has its merits when you try to do something very big, like launching dozens of missions in short time, etc... it helps with automating things that are otherwise tedious when playing with repeated missions. Glad to see you are getting your feet wet with Kerbal. The Multiplayer prospect sounds exciting. I look forward to your Kerbal blogs and also would love to know which mods you use. I use Kethane and Mechjeb. I'm having a lot of fun with vanilla KSP. Granted, I haven't even bothered to do any math yet. I've mostly been blowing up variously silly rockets to figure out how everything works, and daring myself to get the little Kerbals to survive increasingly hairy catastrophes. I love the "oh no!" expressions on their silly little faces as everything flies apart. Planetary orbit is next. Whee!